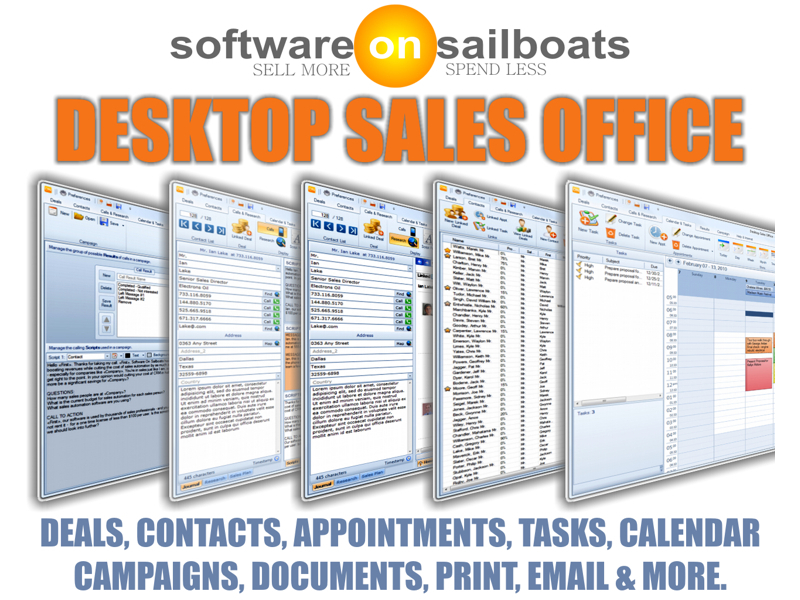 Desktop Sales Office is Windows PC software for sales professionals and sales teams. Track, manage, and master every deal and your entire sales pipeline: revenue, dates, status, probability, journals and more. Deals are linked to contacts, related deals, documents, appointments, tasks, and web pages. Import, change, or mass click-and-update your contacts.Automatically track and journal calls, mail, email, appointments, tasks, progress, and notes. Sales Software For Sales Professionals And Sales Teams for PCs and Smartphones. ...... Organize your contacts by rating, categorizing and connecting them. * powerful, compelling mail and email messages to groups targeted by property or commonality. 1. Import contacts and deals from sources like Outlook, Hoover's, ZoomInfo and Spoke. 3. Automatic logging/journaling of every message sent or printed. * deep information about each contact from the vast array of Internet resources that are pre-programmed into a unique integrated browser - news, financials, and business/contact information providers like LinkedIn, ZoomInfo, and Spoke. * right people with personalized email and calls with scripted talking points. Have your resources ready to address their questions, then time stamp and save the details of every conversation. Desktop Diet is a comprehensive diet and fitness analysis solution for your PC. Qweas is providing links to Desktop Sales Office 10.5 2010 as a courtesy, and makes no representations regarding Desktop Sales Office or any other applications or any information related thereto. Any questions, complaints or claims regarding this application Desktop Sales Office 10.5 2010 must be directed to the appropriate software vendor. You may click the publisher link of Desktop Sales Office on the top of this page to get more details about the vendor.